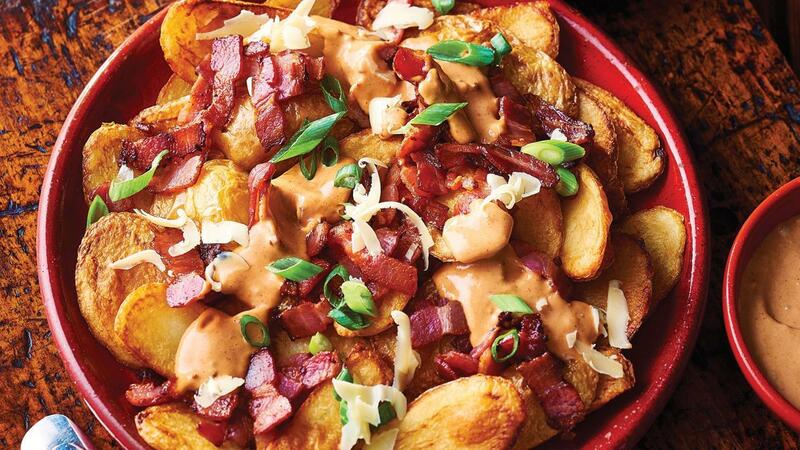 Sure to be a game time favourite, these crispy potato skins with melted cheese, streaky bacon and chipotle mayonnaise go perfectly with a cold beer and friends. Fry the potato skins twice. In a bowl, combine KNORR Mixed Chilli Puree, HELLMANN'S Real Mayonnaise and KNORR American Chipotle BBQ Sauce GF. Place skins on a platter, top with cheese and bacon. Drizzle over Chipotle Mayonnaise and garnish with green onions.